Is Nova Scotia Ready for the Atlantic Immigration Pilot? Sign up and receive invitations and updates from the MacEachen Institute. This panel discusses key aspects of the ONE Nova Scotia Coalition, including the Ivany Report, the implementation of policy recommendations, and the process for tracking socio-economic progress. It considers ONE NS in light of both its historical origins and its current development in order to offer fresh perspectives on provincial governance and policy formation. Jerry Bannister is associate professor in the Faculty of Arts and Social Sciences at Dalhousie University and Coordinator of the Canadian Studies program. He is an award-winning historian, trained at the University of Toronto. Dr. Bannister’s research covers topics such as energy projects and regional politics in Atlantic Canada. He has served on the boards of several national organizations and is a past Chair of the Editorial Board of the Canadian Historical Review. He is also a member of the MacEachen Institute’s Research Committee. Karen Foster holds the Canada Research Chair in Sustainable Rural Futures for Atlantic Canada. Her CRC research focuses on how government policy, global markets and local everyday life intersect. Dr. Foster’s most recent book, Productivity and Prosperity, challenges the notion that increasing productivity is the best or only way to guarantee prosperity to ordinary people. Danny Graham has held senior positions in business, law, government and politics. He is best known as the former Leader of the Nova Scotia Liberal Party and MLA for Halifax Citadel. He is currently the Chief Engagement Officer for Engage Nova Scotia. Mr. Graham has been a board/commission member for many organizations, including the ONE NS Coalition, which wrote We Choose Now: A Playbook For Nova Scotia. Rick Williams is sole proprietor of Praxis Research & Consulting Inc. and currently leads a $1.4 million federally funded research project on labour supply challenges for seasonal industries in Canada. Dr. Williams served as Deputy Minister for Policy and Priorities in the government of Nova Scotia, responsible for whole-of-government initiatives in health care, post-secondary education and rural economic development. He was the government’s lead in establishing and supporting the One Nova Scotia Commission (the “Ivany Commission”). 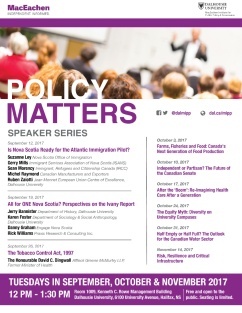 Policy Matters is a weekly panel discussion on major policy issues presented by the MacEachen Institute for Public Policy and Governance and in collaboration with the Dalhousie School of Public Administration. Each discussion features thought leaders from civil society and focuses on one of the Institute's four research themes – Civic Engagement, Atlantic Canada and the World, Health Systems and Governance and Smart Infrastructure. 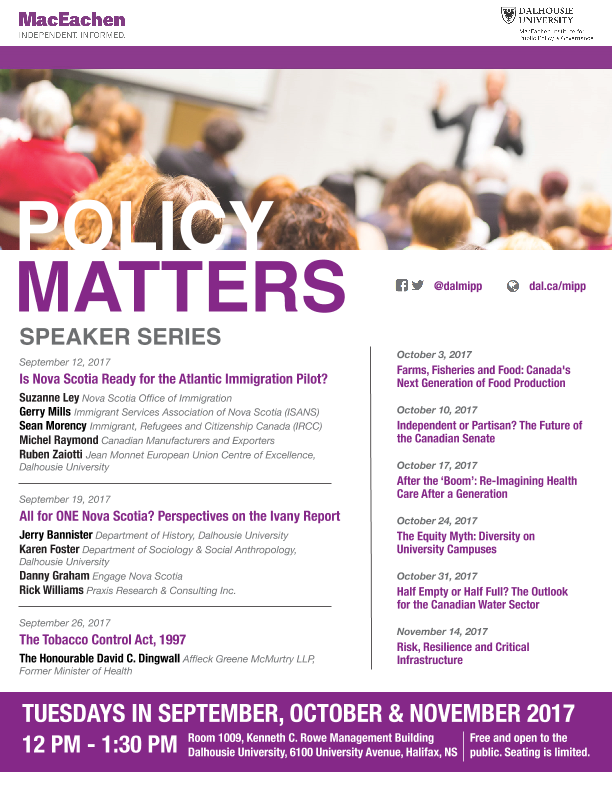 Held each Tuesday from September 12 to November 14, the discussions take place in room 1009 of the Kenneth C. Rowe Management Building at Dalhousie, from 12:00 pm – 1:30 pm. The events are designed to encourage public engagement with local, national and international policy issues and are open to the public.